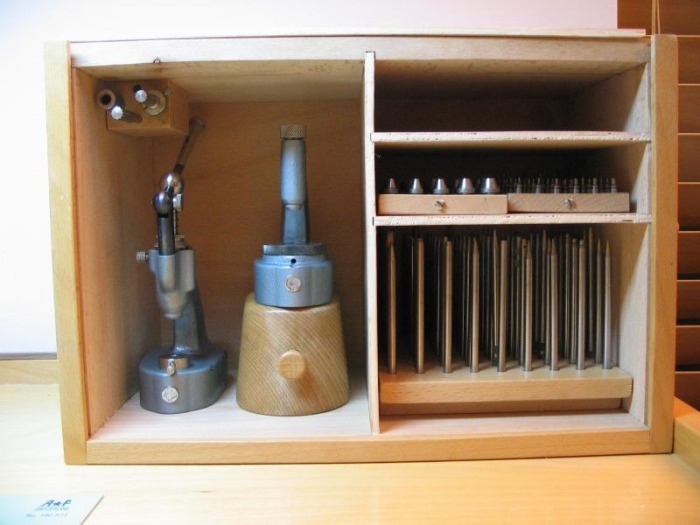 I thought it may be of interest to some readers to see some of the tools which are specific to the watchmaker. Some tools not presented on this page will be described when they are used for their specialized purpose. 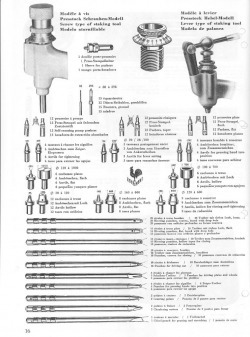 However, this page will describe general purpose tools that are used for various applications. Throughout this site I point out the specific brand of tool which I used. I have no affiliation with any tool maker, and I do not sell or distribute tools. In most instances it is the only brand I have experience with, and I provide this for the readers' information and so that there will be little question as to what is being demonstrated or what was used. 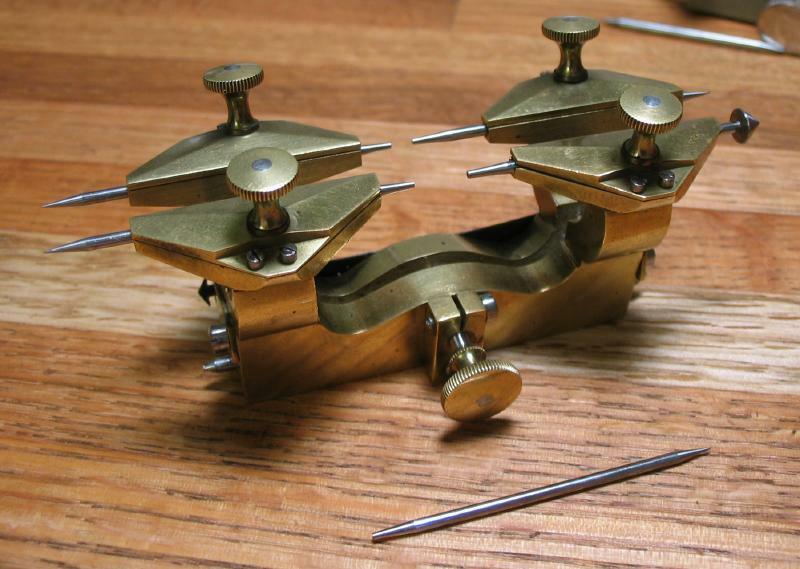 A tool set, referred to as a staking set, is the watchmakers' one-thousand-and-one-uses tool. 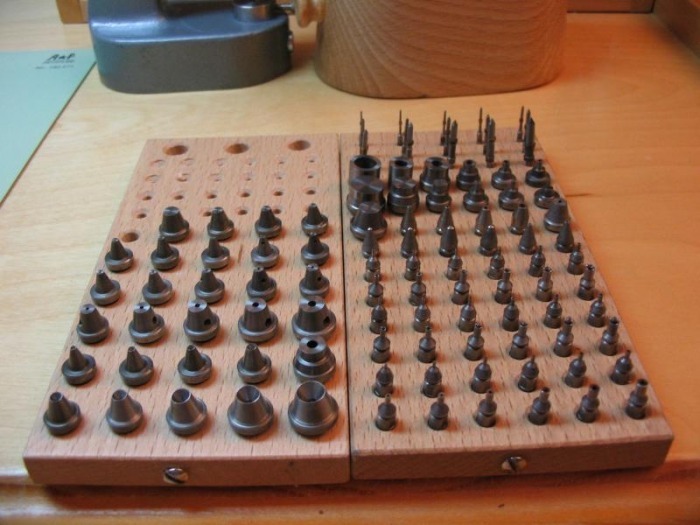 It can be used for any number of different tasks, but principally it is for riveting (i.e. staking) components together or for driving components apart. The tool assures that these processes occur in an uprighted fashion, in that the staking punch is held vertically and the component is positioned directly below the punch in the horizontal. This setup is the basis for the countless other tasks that can be performed with it. The use of staking tools is covered in most texts. Archie Perkins covers the subject very thoroughly in volume 1 of Antique Watch Restoration. 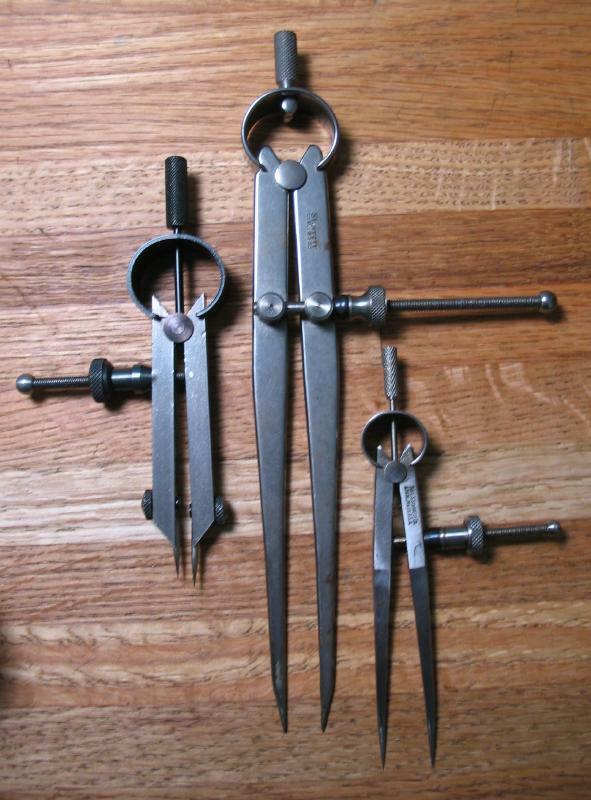 Another closely related tool is the jewelling set, generally it operates on the same principal, but on a smaller scale. Its primary function is for pressing friction-fit jewels into place. The sets are supplied with special reamers which are of the dimensions necessary to produce a hole of the proper friction fit dimension. 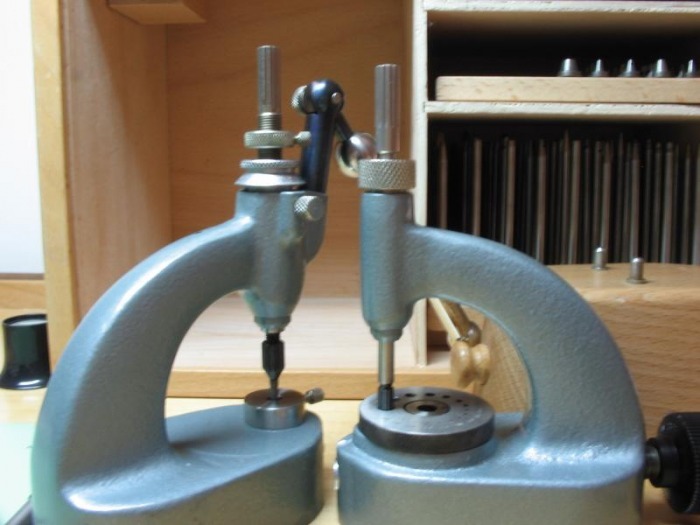 The anvil usually has a micrometer adjustment and is operated by a lever rather than with a hammer. 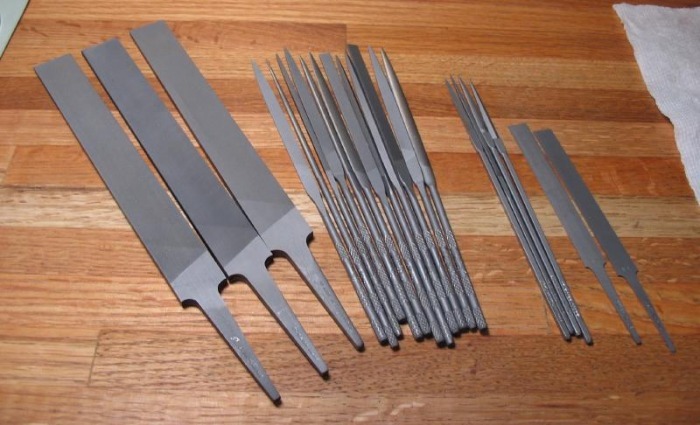 The set shown below is a combination staking and jewelling set and was made by the Swiss company, Horia. It is rather unique in that it is equipped with two anvils for the separate functions. 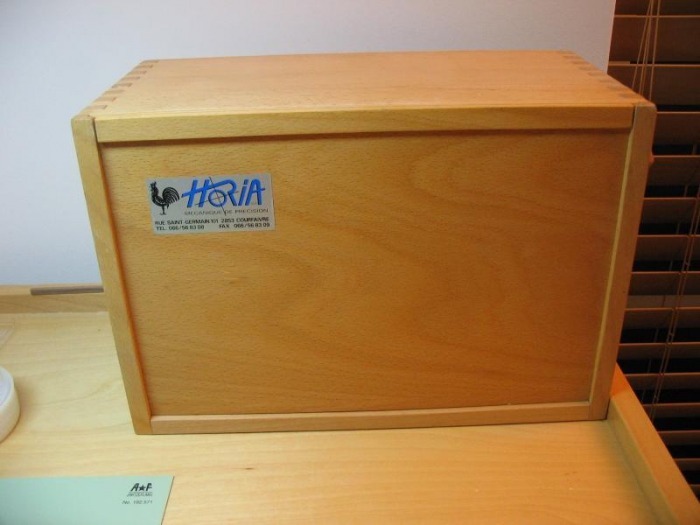 Horia no longer manufactures this particular set, but offers a wide range of similar tools. I found this one second hand, and was not previously used but was not stored under the best conditions. However, it cleaned up well. The wooden base is to allow the use of staking punches as stumps, by inserting them into the base and placing the anvil over top. There are a total of 78 stakes. Various stumps, pushers, reamers, etc. There is a pair of pin vises (primarily for using the reamers) and an adaptor for using them on either anvil. Here are copies of catalog pages for staking sets that I received from Horia a number of years ago. I have a slightly different version of their largest set on page 14. You can see descriptions of the various stakes and stumps and hints to their uses. Unfortunately the various other accessories are no longer available, such as the platforms for separating. These are useful for removing rollers and similar tasks. 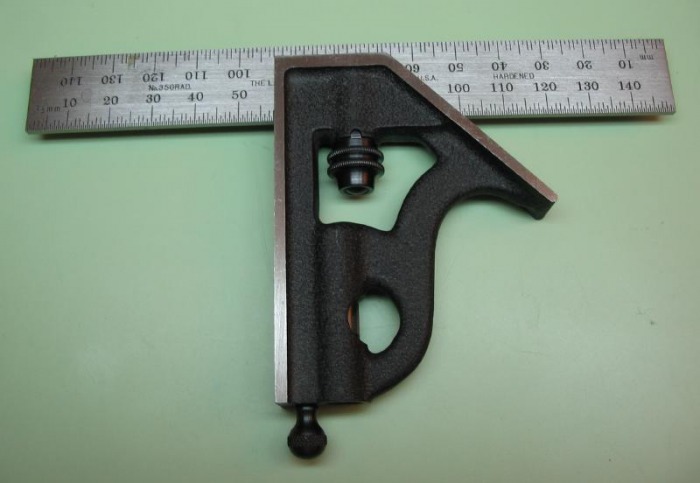 Although the Horia set is quite nice, I have found the jewelling anvil a bit large for wristwatch jewelling. I happened across a "new-old-stock," Favorite brand jewelling tool. Another seemingly lucky find, it was still in the original packaging and VCI paper, etc. It is nearly identical to the Sietz or Bergeon brand jewelling tool sets that can currently found. I demonstrate the use of the depthing tool on various pages. The first instance is on the Mainplate page where the barrel and center pinion are depthed. 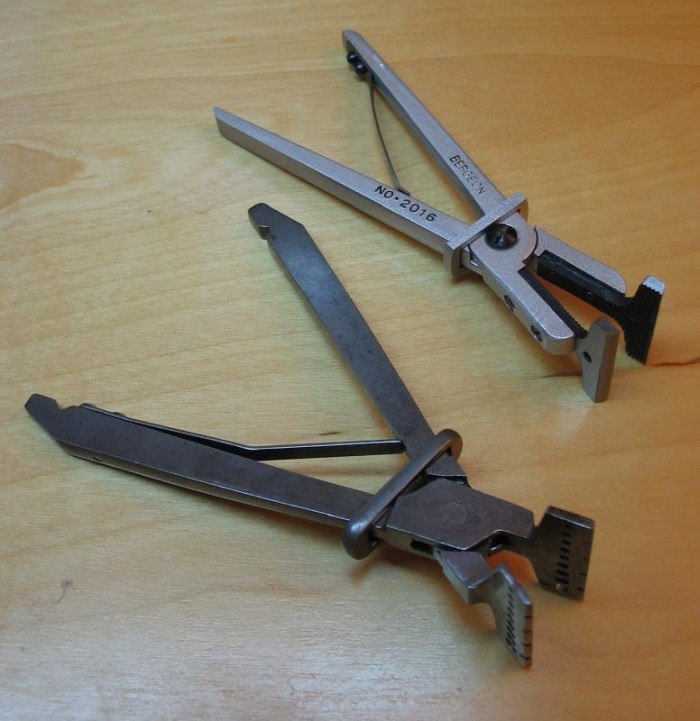 They are an essential tool for making a watch by hand methods. Essentially a hinge with parallel runners. The runners hold two mating components, and by adjusting the hinge the depth between the components can be ascertained. The runners are sharpened so that this depth can be scribed onto the movement plate. More thorough explanations of depthing tools and their use can be found in various texts, including Daniels, Gazeley, Wild, etc. 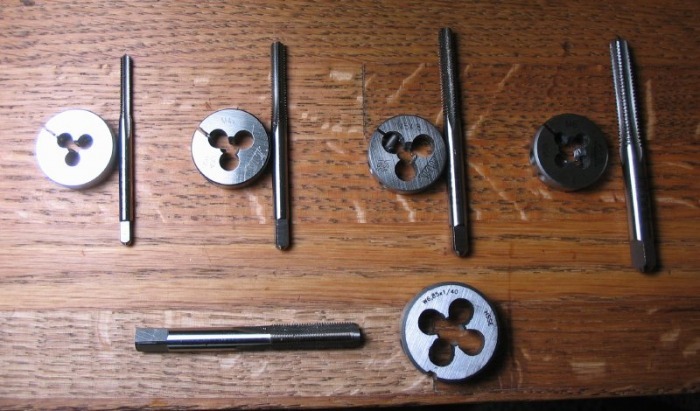 These tools are generally obsolete in the modern watch factory, where center distances are predetermined and parts are machined to extremely tight tolerances. Two tools are shown below. They are approximately the same size, one is a Favorite brand (Swiss made) and the brass constructed one of an unknown maker. I generally prefer the brass one, but the Favorite has more rigid (thicker) runners. George Daniels once said that the difference between working on a Bentley and working on a watch was the size of the hammer. Obviously he was being facetious, however, there are a vast range of different hammers that one can find in the workshop. Especially for goldsmithing methods, there is a endless number of hammers for different operations. 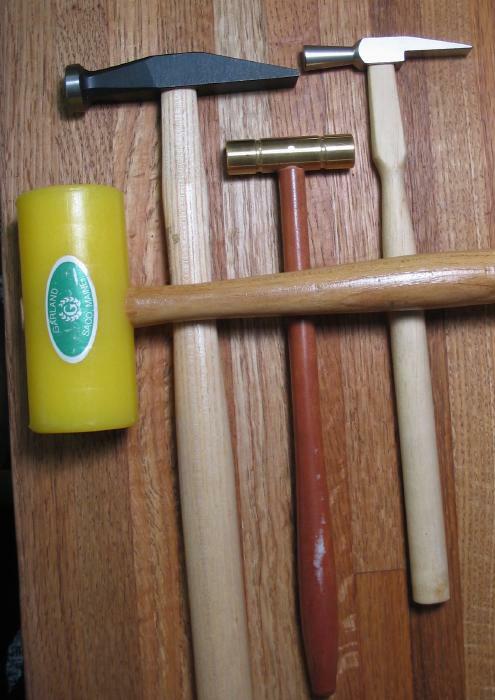 Shown below are my most frequently used; a standard "goldsmith's" hammer, a watchmaker's rivet hammer, a brass mallet (preferred for staking), and a plastic mallet. One cannot possess too many files! If you browse a jeweler's tool catalog, you will discover there are numerous different files available. Various shapes and sizes and coarseness are available to suit just about every job. I would recommend Grobet-Vallorbe brand files, made in Switzerland. They are very well made and seem to last forever. Obviously buying every size is not realistic, and I have obtained them as needed for the jobs at hand and eventually a collection is built. 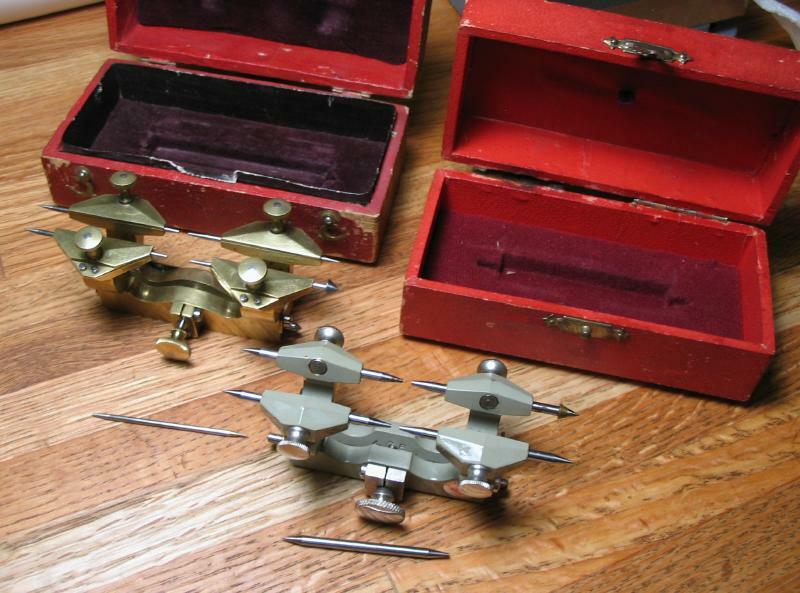 Shown are three grades of hand file, a set of needle files (offered in sets of 12 different shapes), a selection of 'escapement' files that were purchased for filing wheel spokes, and a pair of screwhead files for forming the slot in screws. 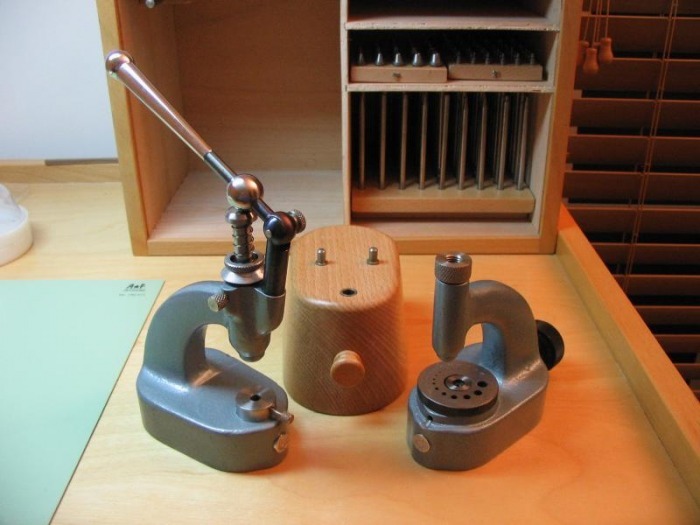 I resisted using handles for a long time, however, I recently tried the Grobet screw-on type of handles, and they make filing much easier, giving much more control over the larger files. They are very simple to install, simple screw on, the handle locks on tight. Grobet USA is the distributor of Vallorbe files in the U.S. Their catalog of files can be found here. Files with "safety" edges (non-cutting) can usually benefit from some additional smoothing on an India stone. This removes any burs left from manufacturing and ensure that it will be non-cutting when using the file. I found some unusual files when rifling through an second hand tool dealer's stand. They become other shapes in the arsenal. and included a small cut 6 equalling file, and rounding-off file (with safety), and an escape wheel rim finishing file (with safety). HF13, HF43, HF113, HF813, HF873, and Fine India FF14, FF44, FF114, FF214, FF724. 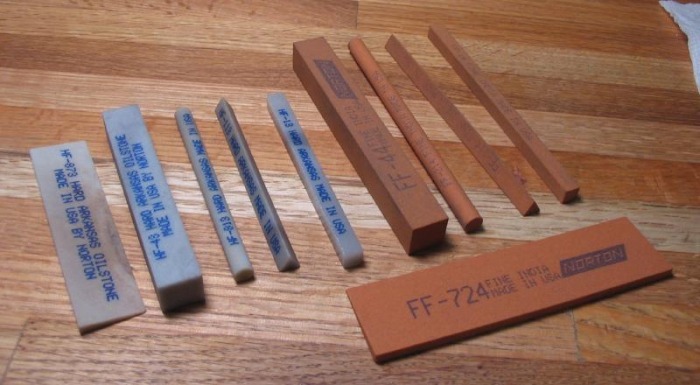 Closely related to the stone slips above is a set of 'midget' stone files made from synthetic ruby, actually an engineered ceramic composed of aluminum and chromium oxides. The particle size is specified as 10 micron. They are often referred to as Degussit stones. They are manufactured in Mannheim, Germany, and I found them at Gesswein. Information on the midget files and material can be found here FRIALIT-DEGUSSIT. The set includes a pin vise for holding the smaller sizes, and 11 different stones in various shapes and sizes (see the web link above or section from their catalog below). The tiny size and very fine grit makes them very useful for getting into very tight spaces for final finishing. 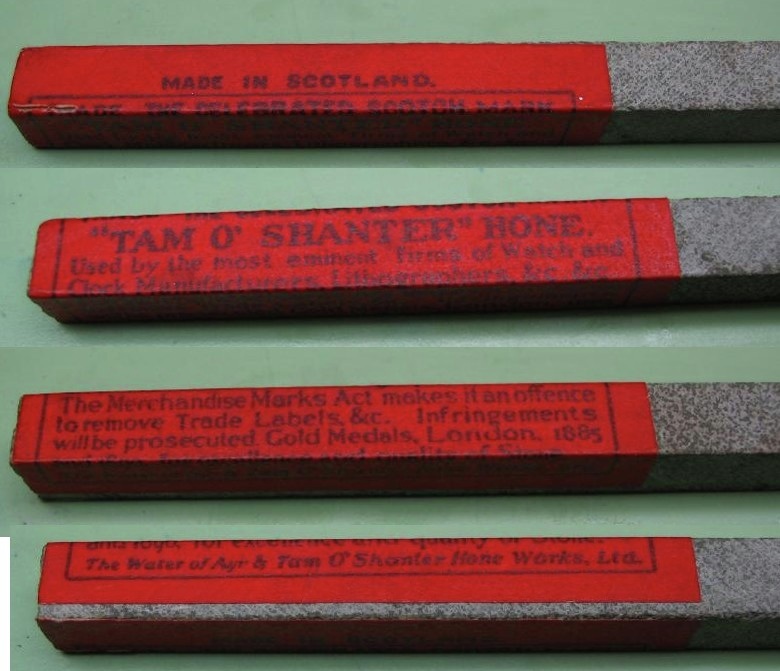 These stones are mentioned in various texts for scrubbing and polishing brass. They cannot be found anywhere for sale these days. I read that the mine (Dalmore) where the stone was sourced has closed and therefore no more cut stones are being produced. A fairly complete discussion can be found on Wikipedia. I found this one at the table of a tool dealer at the Cabin Fever Expo. It has obviously been waiting a while for me to find it. This leads into the discussion of bench stones. There are some different opinions of the selection of bench stone that one should use, and it is a question of personal preference, I think. 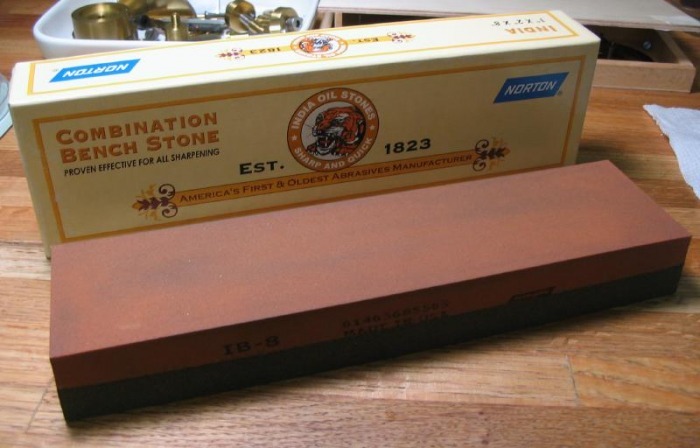 Shown is an Norton India oilstone (model IB-8), I do not know how these stones get their names, but India oilstone is a man-made Aluminum oxide stone, this one is a combination stone, having a coarse side and a fine side. 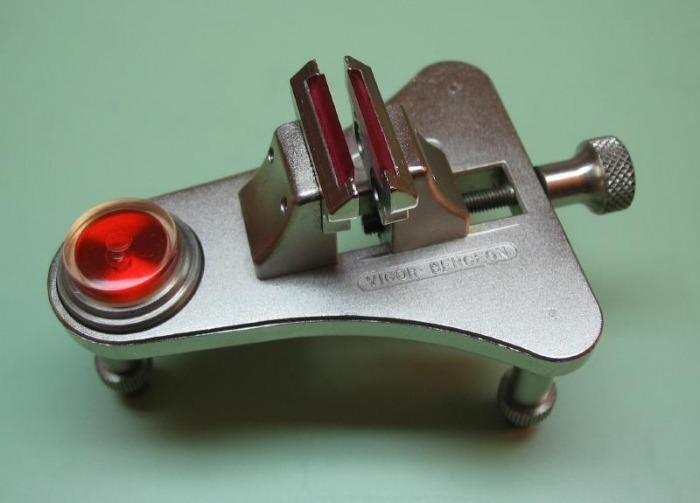 The fine side is used for most sharpening jobs, gravers, cutting tools, screwdriver blades, etc. For a very fine finish a hard Arkansas stone can be used. There are a lot of stones calling themselves 'hard Arkansas,' however they are not all the same. The type shown below (Norton HB4) is a natural stone, called Novaculite (mined in the Ouachita mountains of Arkansas, hence the name 'Arkansas'). It is very smooth, and imparts very little cutting action. Norton classifies it as 'ultra-fine.' Generally, I use the fine oilstone (above) and finish (if needed) with a couple strokes on the Novaculite to deburr the edges. 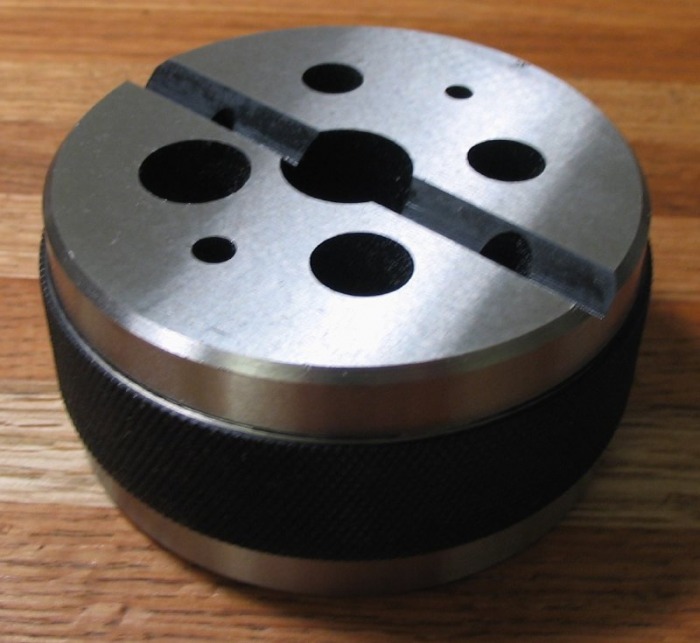 While I am on the subject, another abrasive file that is useful for various tasks, such as sharpening carbide lathe cutting tools are diamond laps/files. 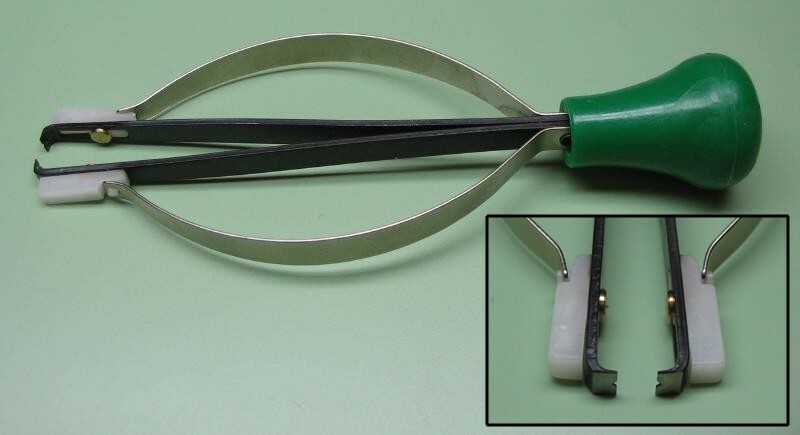 Shown are the EZE-LAP diamond hone, and consist of plastic handles with 3/4" x 2" diamond grit pads of Superfine (1200), Fine (600), Medium (400), Coarse (250), and extra Coarse (150). 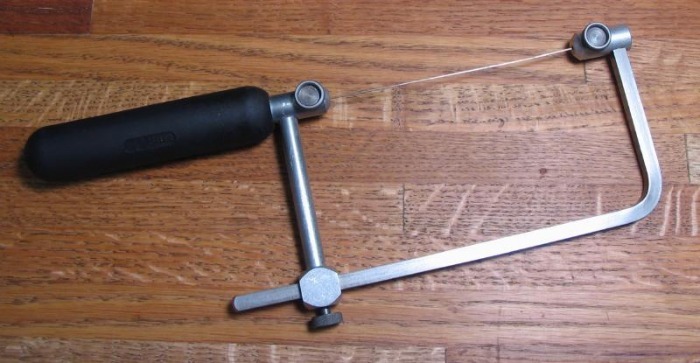 A frequently used tool in small metalwork is the piercing saw. I am using a Grobet adjustable frame model. I like the adjustable frame so that saw blades are easily mounted and then tightened. This is advised against in the literature, and it is important that the blade be very tight. The saw blades for these saws are available in a wide range of sizes and types. Having a wide selection of sizes is helpful to best suit the thickness of the work. The measure is rather obscure, ranging from 8 (the largest) down to 1 and then continuing from 1 to 1/0 on down to 8/0 (the smallest). They are frequently sold by the gross (144), which seems like a lot, but they frequently break, at least until one gets a some practice. Hacksaws are useful for general stock preparation. A bandsaw or cut-off saw or some other mechanical means of sawing stock would be useful, but the simple, labor-intensive method is with a hacksaw. 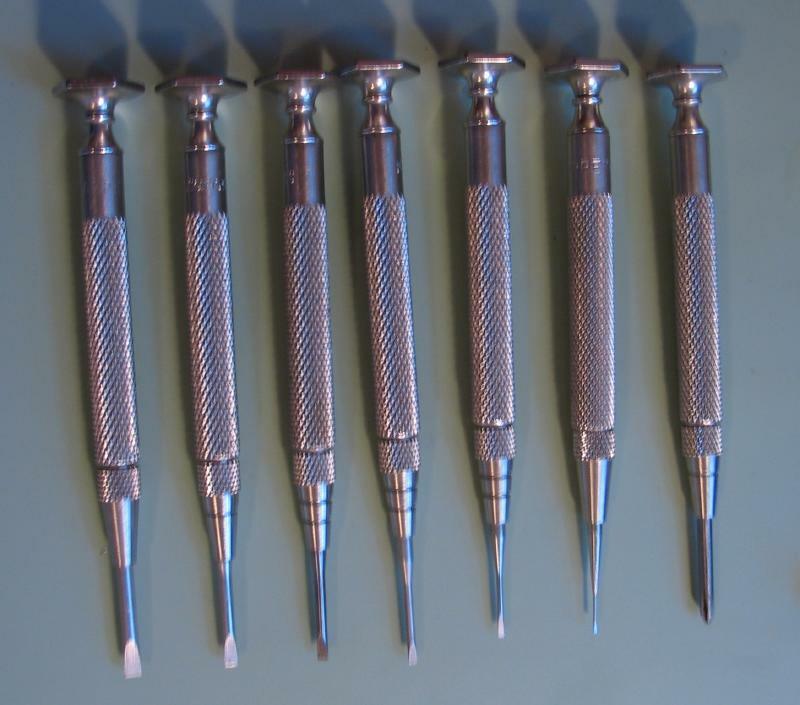 A collection of tools used quite frequently are cutting and smoothing broaches and pin vises. 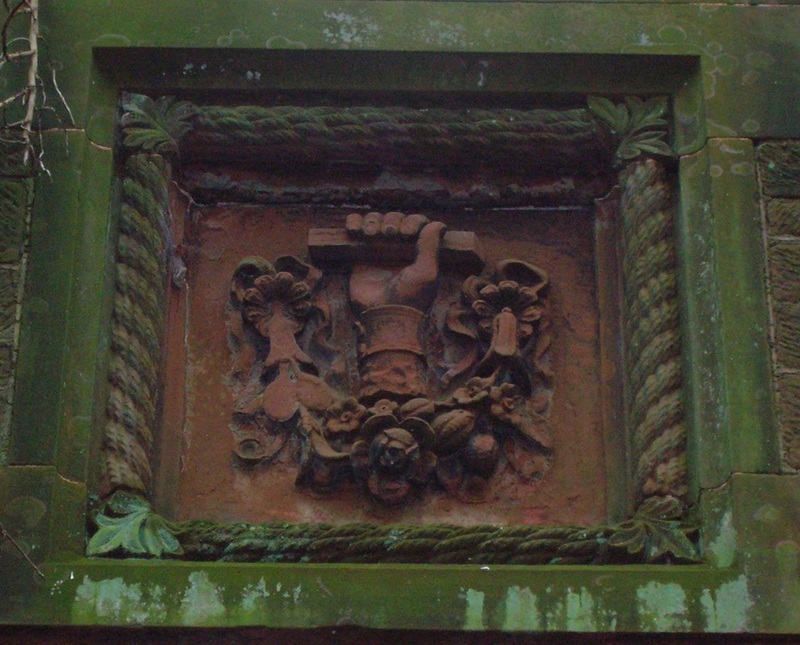 Broaches are used to open and finish holes. Pin vises are used repeatedly for numerous tasks, and a good quality set would be highly recommended. 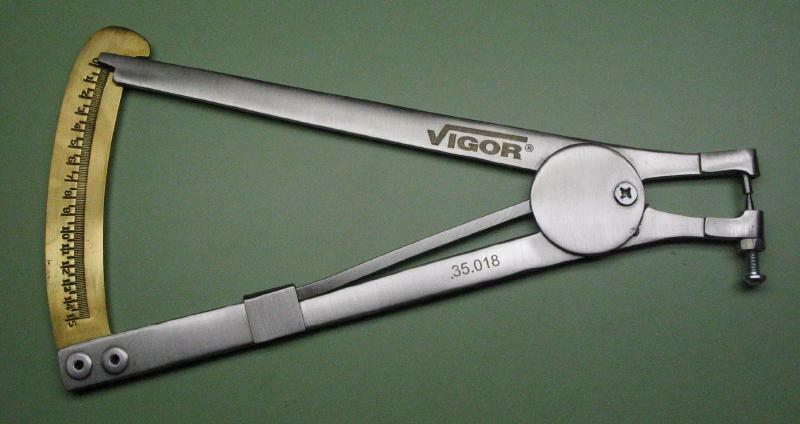 Bergeon 30026-A First Quality pin vises. These pin vises have two collets each (except the smallest one), which can be annoying when having to stop and disassemble the vise to change collets, but otherwise I've found this to be a great set and frequently used for holding small tools or work. Grobet-Vallorbe Scraper, useful for removing burs or scraping metal edges. 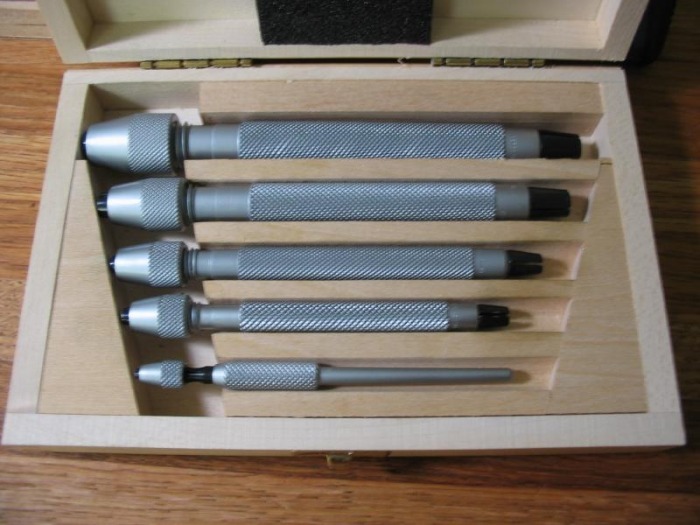 Screwdrivers, a good set of assorted screwdrivers is a basic necessity (shown is the nine sized set 30009). Some may conclude that an expensive set means they are perfect and will never need service. The blade of the screwdriver is made of tempered steel, and wear fairly quickly with use. They need to be touched up frequently on the bench stone to restore the shape. Regarding the shape of the blade; it seems to be a debated topic whether the shape should be hollow ground or wedge shaped. If the screws are handmade using a screwhead file to form the slot, a wedge shape screwdriver blade fits nicely. 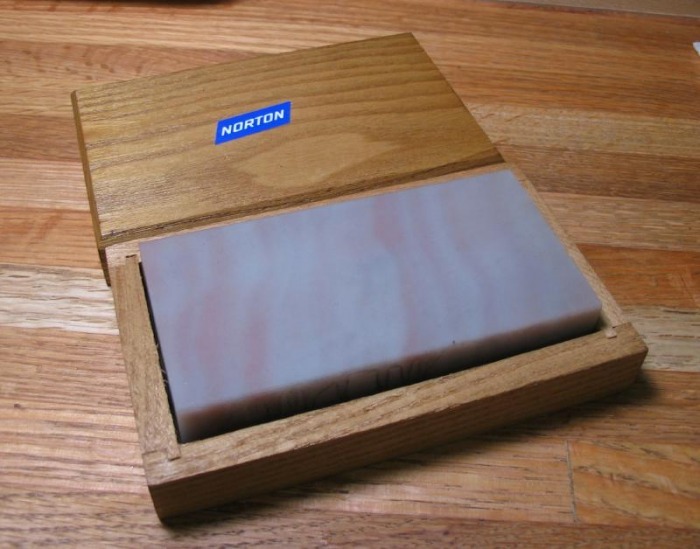 Also, the wedge shape is easily formed on an oilstone. See Daniels' "Watchmaking" figures 21 and 22 (1st Edition). 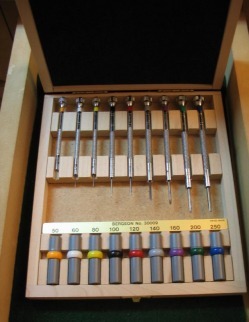 Starrett offers a set of screwdrivers (No. S555Z-7), and are well made in nickel-plated steel and with a swivel head. The removable blades are held by a collet type system, rather than a set-screw as found on the Bergeon set. To work on a watch one needs screwdrivers, to make a watch one will require taps and dies to make the screws themselves and to thread the matching holes in which the screws will ultimately reside. For watch-size screws (in this case 0.3 to 1.5mm) the only manufacturer of taps and dies in these tiny sizes is Bergeon. Perhaps there are other makers, but in the USA this is only one which is imported, and there does not appear to be a domestic source. 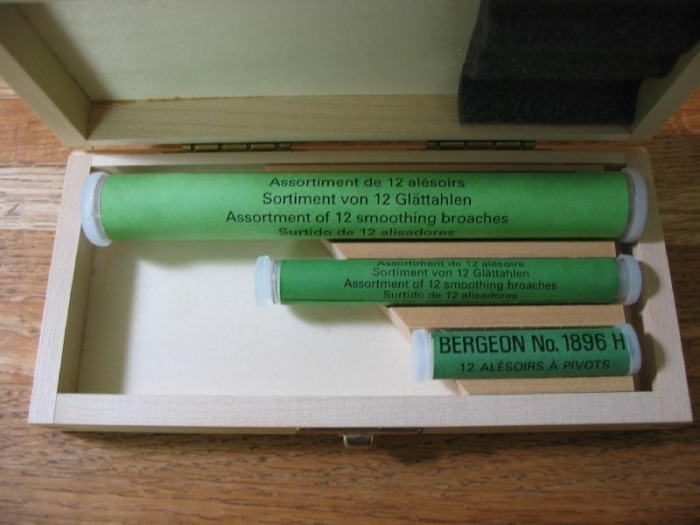 When I decided to take the plunge and purchase the required taps and dies (they are expensive), it happened that Bergeon was in the middle of either retooling/redesigning their dies or were in search of a new manufacturer. At first the various distributors simply told me that they were discontinued and no sets were available. Fearing the worst I called every distributor and ordered the various taps and dies individually as they were in stock until I had a complete set. I now see that they are again available, and at about twice the price! 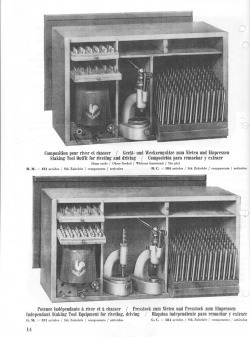 Example of 0.40 and 1.00 mm tap and dies pairs. 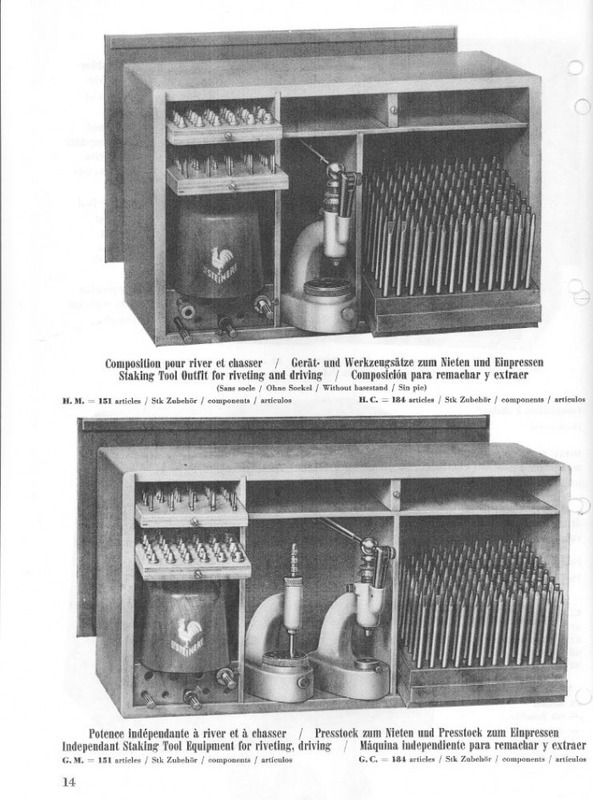 For general toolmaking one will require larger sizes of taps and dies. For these there are a number of different makers from various countries. I can only recommend, as with any tool, that you purchase good quality, as it pays for itself in the end. A high quality American made brand is Greenfield, their full catalog can be downloaded from their site, it is fairly large. I made a excerpt below that contains the basic metric sizes. These too are quite expensive, but last for a very long time, especially in the home workshop. I purchased them as I needed them. Shown is 3mm x 0.5; 4mm x 0.7; 5mm x 0.8; and 6mm x 1.0. 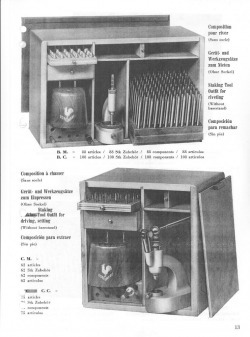 Also, at the bottom are the tap and die to form the threads found on collets and the drawbar of the watchmaker's lathe (this pair is not made by Greenfield). 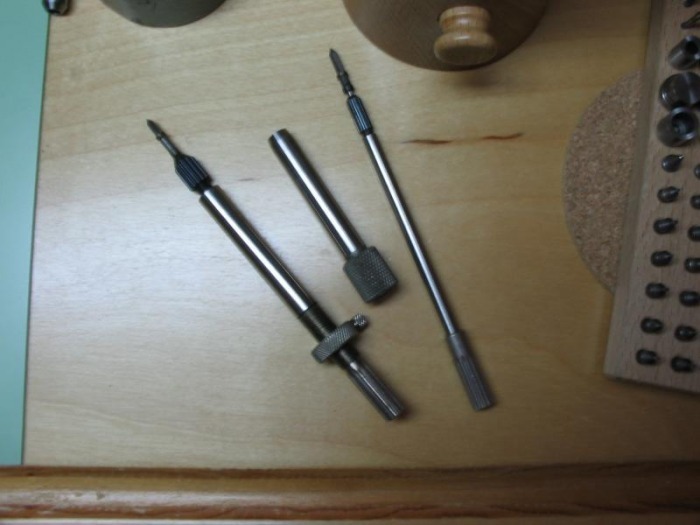 To countersink holes and round over the ends of pins, etc. 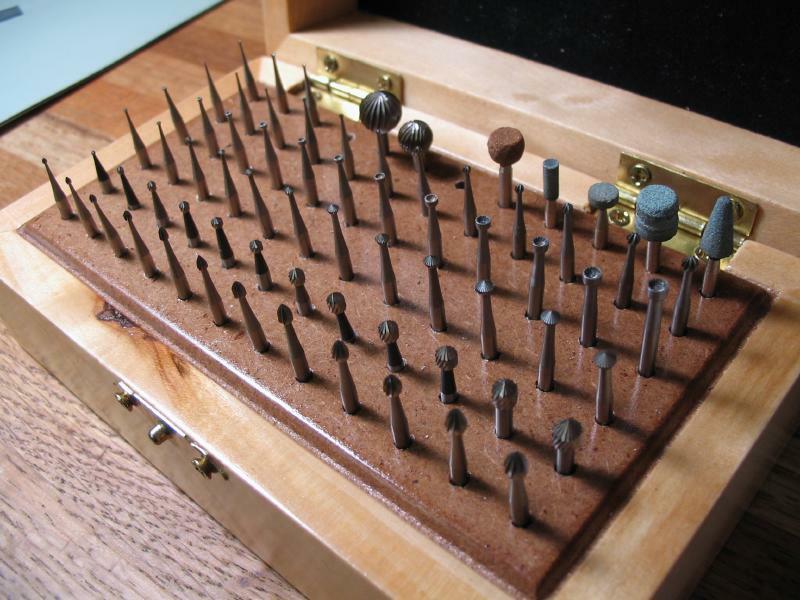 a set of various jewelers burs will come in handy. 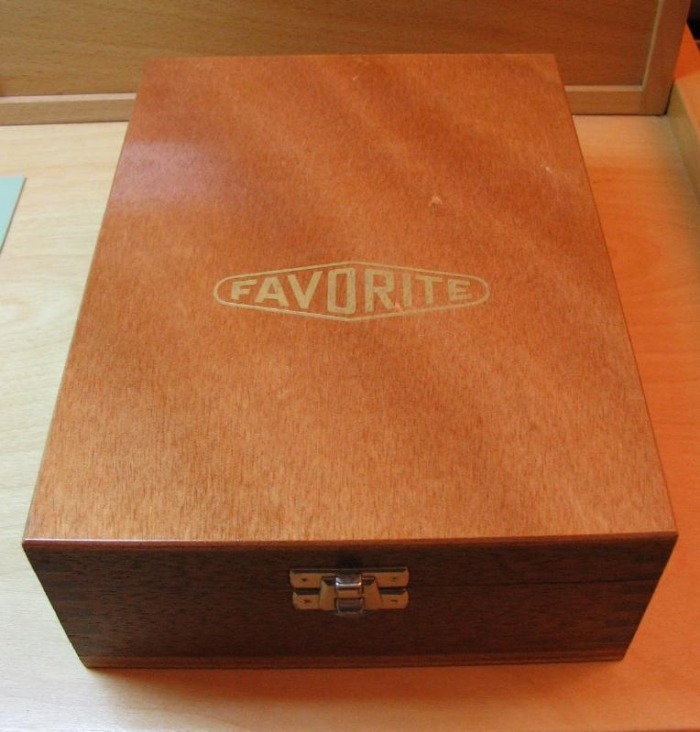 These can be found from any jewelers tool distributor, and seemingly countless size and shape combinations exist. 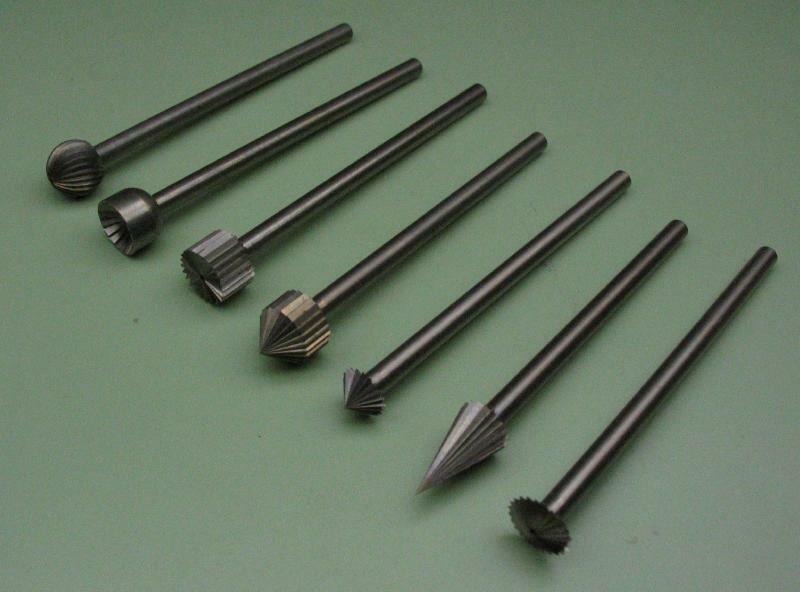 They are available in various grades of steel and carbide as well. Shown at the right is a selection of larger sized burs made by Dentsply Maillefer to shown some of the shapes that are available. 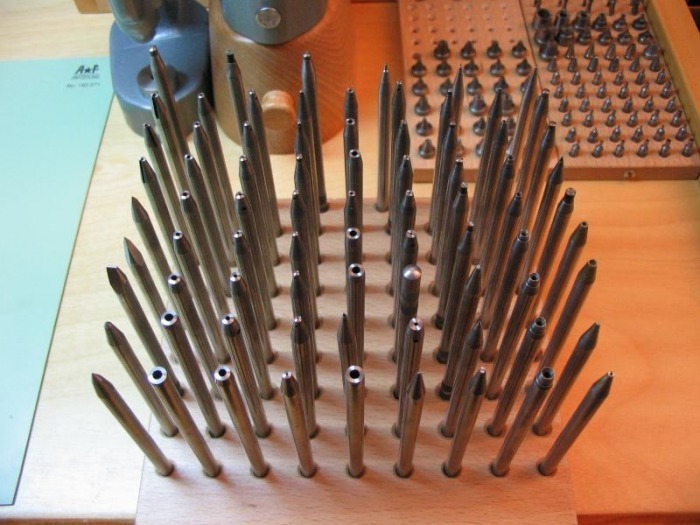 The most useful seem to be cup burs for rounding over pins and spherical and 'setting' burs for countersinking holes. 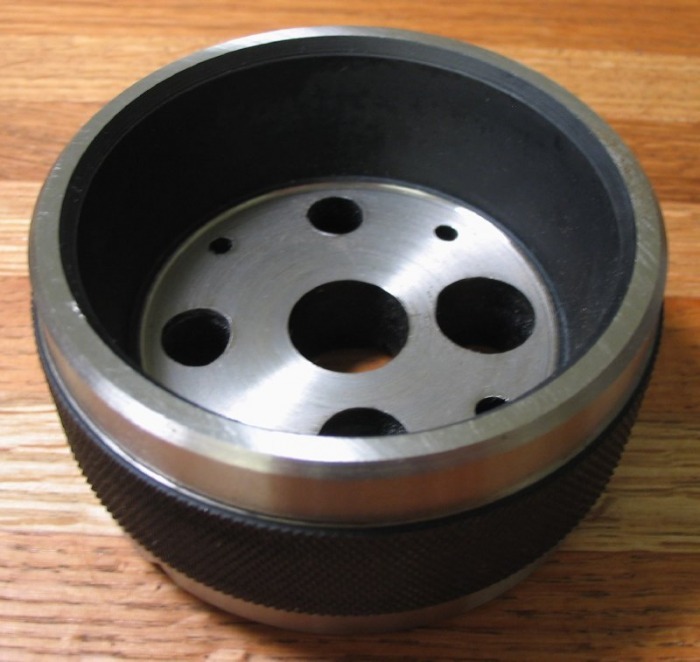 They can be used by hand while held in a pin vise or mounted in a spindle, such as the lathe, drill press, or flex shaft depending on the situation. They typically have a 3/32" diameter shank. Poising tool. This was a used purchase, they are quite costly to buy new. This one is a Vigor-Bergeon No. 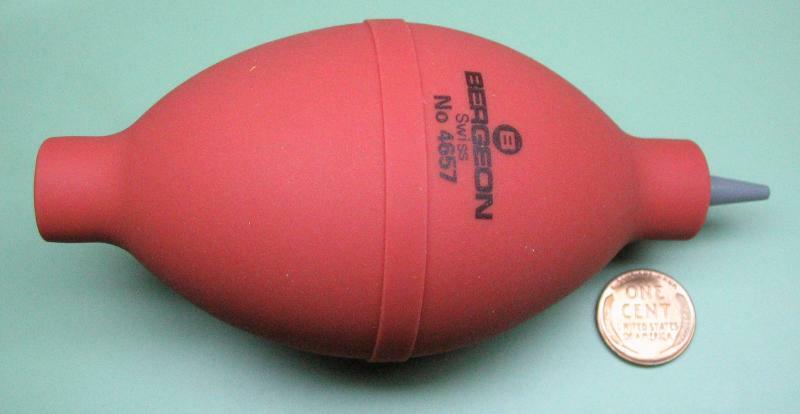 2802 and is essentially identical to the current Bergeon 2802 model. It is for testing the poise of balance wheel assemblies or any round object with an axle (e.g. tourbillon carriages). The bubble level can be placed onto the ruby jaws to set the tool level using the adjustable legs, and the jaws can be positioned to allow the pivots of the object to be poised to rest upon them. The object is tested by allowing it to spin and come to rest, it will tend to rest with the heaviest side down. The object is adjusted by whatever means appropriate (filing, chamfering, moving weight screws, etc) until the object will spin and comes to rest with no preference to a particular side. Like many watchmaking tasks, it is an expensive tool and seemingly over-complicated method of achieving a rather simple (but very critical) result. The testing process requires a very light touch (small, soft-haired brush or air bulb) with no other disturbances (air currents, table vibrations, etc) and lots of patience! Various tools are available to remove hands from watches. The critical points are a means of prying the hand at its hub, applying an upward force, and most importantly, not otherwise causing any damage to the hands or dial of the watch. 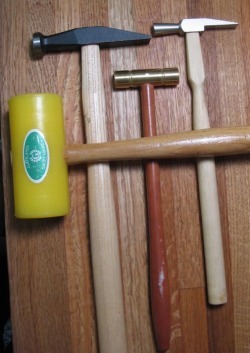 A simple method is to use a pair of simple pry bars. 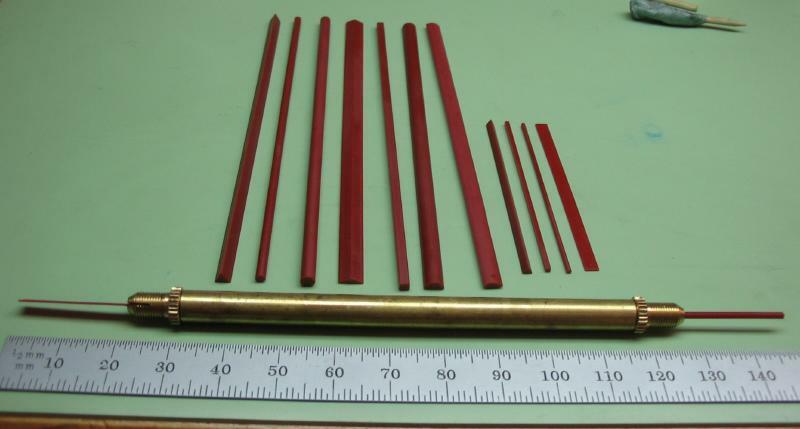 These are available commercially, however, they can be easily made from a length of drill rod and hardened and tempered for use. Bergeon produces a series of specialized hand removers with special functions to suit the various types of hand pulling scenarios one is likely to encounter. The mechanism pulls the hand while simultaneously applying pressure to the dial face with the non-marring plastic feet. Shown are the Bergeon Presto models 1, 2, and 6. No.1 is a hand puller with a spring loaded retainer for securing the hand while prying it from its post. No.2 is a simple version for pulling larger sized hands, and is useful for pulling cannon pinions as well. The No.6 model is similar but a smaller size and useful for seconds hands. Accurate and precise measuring is a basic need in the workshop, especially when making something. Of course, even in horology their are some who use the Imperial system (inches) and some who use metric. Watches are dominated by the metric system, but the ability to measure in both systems can be useful on occasion. 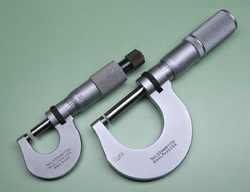 The two basic tools for measuring are the caliper and the micrometer. The caliper is quick to use and can measure depths and inside diameters in addition to basic outside diameters. 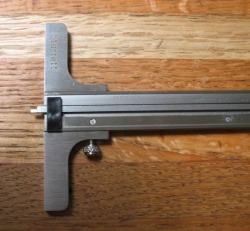 The Starrett 120AM-150 caliper is accurate to 0.02mm, and in some instances this is sufficient. 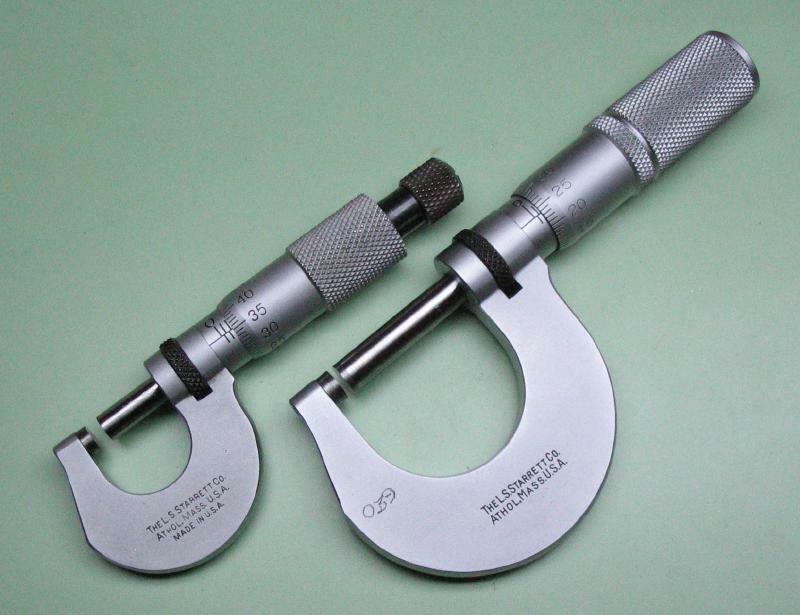 For higher resolution measurement of outside diameters, a micrometer is needed. 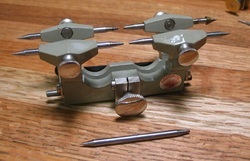 The larger metric micrometer shown below is a Starrett V230MXRL (0-25mm) and is graduated to 0.002mm. A half-size micrometer (Starrett 232M, 0-13mm) can be handy for fitting into smaller spaces or provide more control when measuring small components. Also shown is a Mitutoyo micrometer (# 103-260) which measures in imperial units (down to 0.0001"). 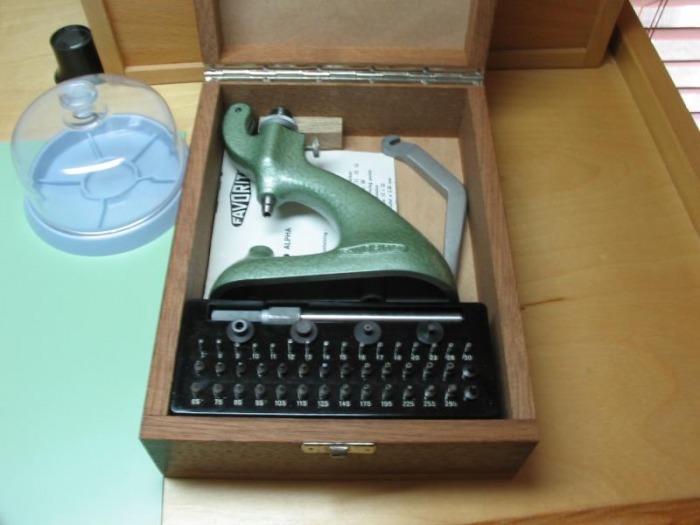 I purchased the caliper above as part of the "Student Tool Set" S903MZ produced by L.S. 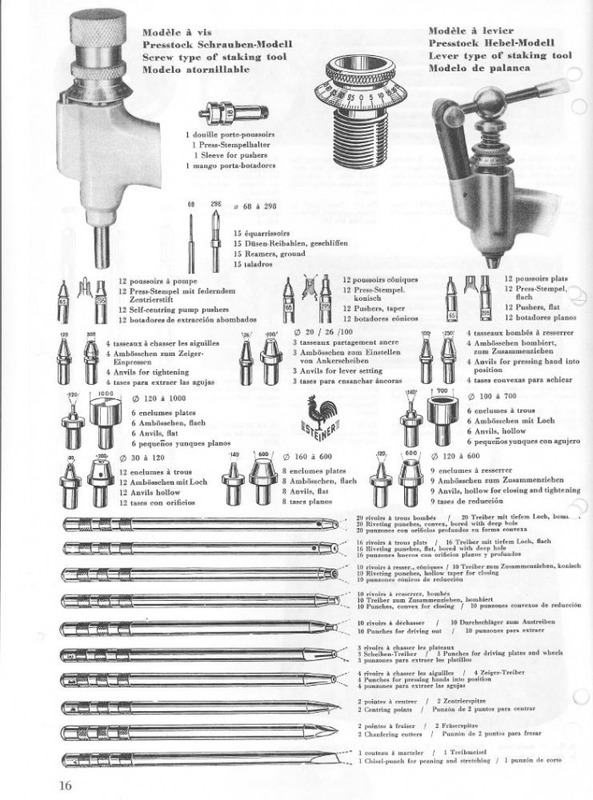 Starrett, who produce some very fine tools and instruments. This tool set includes an 11MH-6-4R combination square (shown below), C330-150 Flexible steel ruler (0.5mm graduations), 83A-6 solid nut divider (a little big for most watch work), an 117B center punch, and the "Starrett Book for Student Machinists." A Douzieme gauge is useful for measuring thicknesses of objects that are otherwise difficult to measure using a caliper or micrometer. The name refers to a unit of measure that is 1/12th of a ligne, however, the gauge shown is graduated in 1/10th of a millimeter. This particular model has an adjustable point that can be reset to zero for certain applications. Heavy gauge, tempered steel rules. Starrett C635 Metric (0.5mm) and C616R Inch (32nd, 64th, 50th, and 100th). Laying out lines onto metal is done with a scriber. 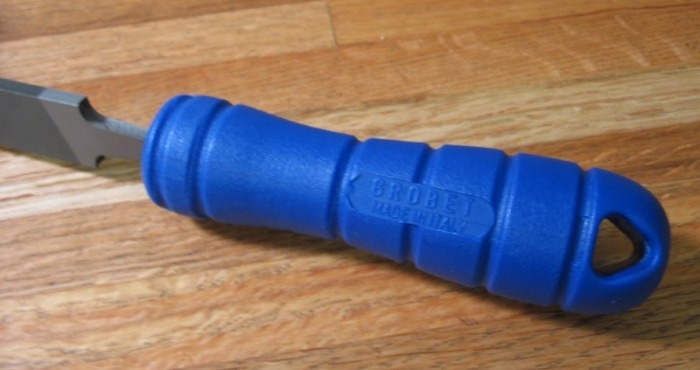 Removable tips are easier to resharpen on the lathe, and can be stored protected within the handle. Scribing circles, arcs, and radii is accomplished with dividers. These can be used to roughly measure distances or directly transfer a measure from an object or ruler to the work. 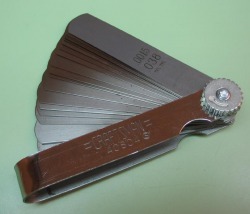 Another useful tool is a set of feeler gauges. These are great for just simple checks of small gaps and checking the progress of reducing the thickness of small parts. When marking positions on metal, a prick punch and center punch is used. 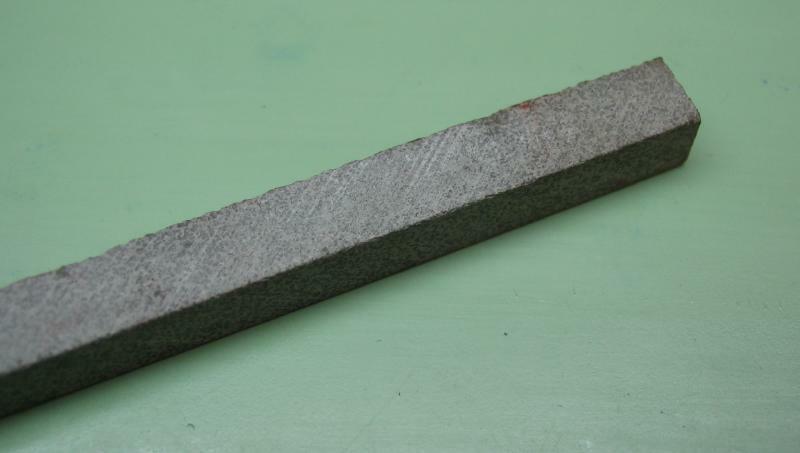 This is a hardened steel anvil, similar to a staking anvil. 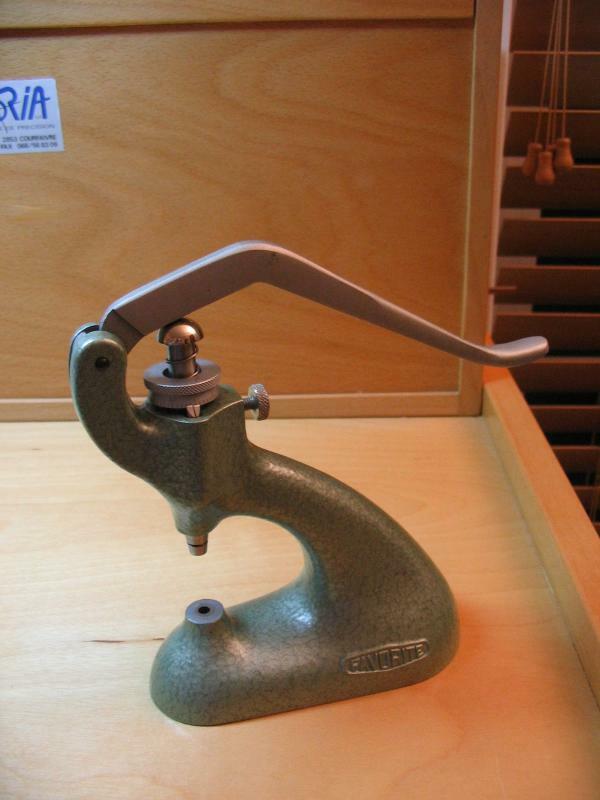 This one is essentially identical to a Starrett No. 129 bench block, although I happened to buy it from Hollingsworth Manufacturing in Marshalltown, Iowa. 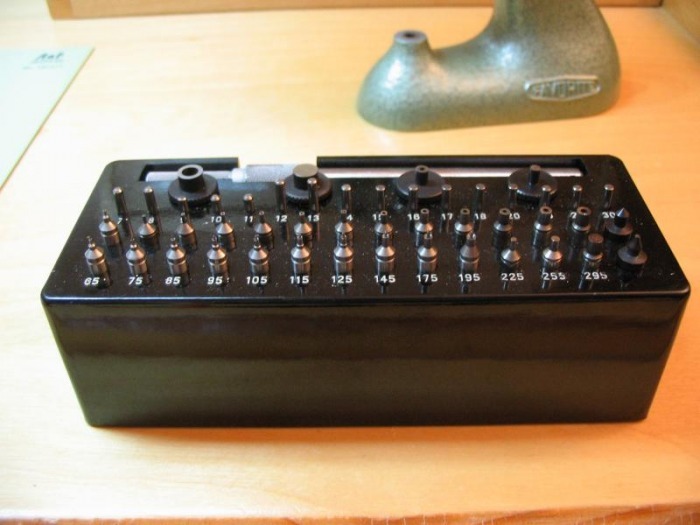 It is a simple multi-purpose tool, for holding and positioning work while hammering, staking, riveting, etc. A source of compressed air is very handy for removing dust or clearing out blind holes or any countless other purposes. The simplest is an air bulb or bellows if you prefer. Shown below is a brand new Bergeon 4657 that replaced a fairly well worn generic rubber air bulb. It was down graded for use around the lathe where clearing metal chips out of tight corners and holes is a regular need. Using it around the lathe also gets the air bulb quite dirty and decided a separate one dedicated to the assembly bench was in order. Choice of magnification is largely a personal matter. I will show what sorts of aids I use, however, I have yet to find an ideal solution, so it is an open ended discussion. 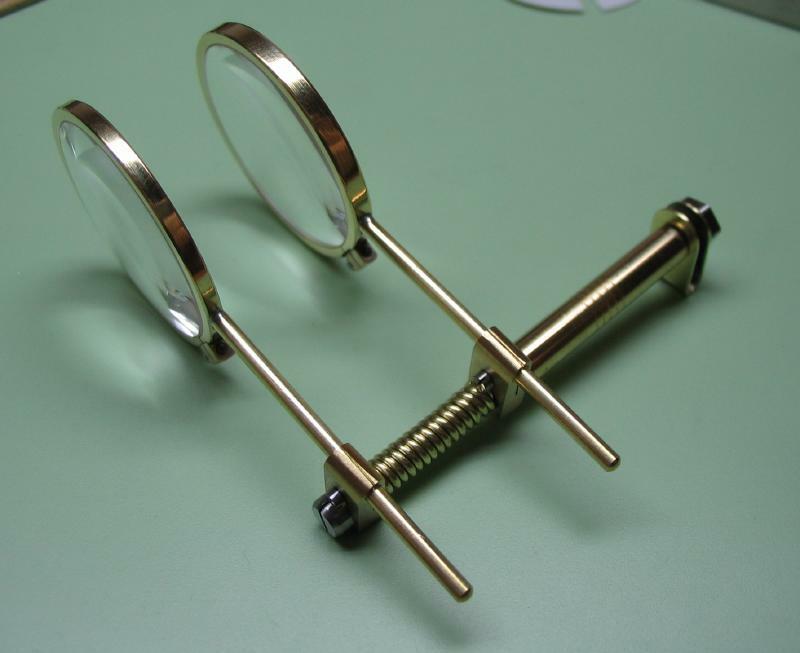 The first type of magnification is the sort most people would associate with watchmakers or jewelers. This is the traditional loupe. They are available in a variety of strengths and lens qualities. They are best suited to those who do not wear eyeglasses, so they are of limited advantage to myself. For quick inspections, holding the loupe in one hand, they are quite useful. One shown below is a Bausch & Lomb 10X Triple-Hastings loupe, and is good quality and a good strength for close inspections. For the eyeglass wearer several options are available. 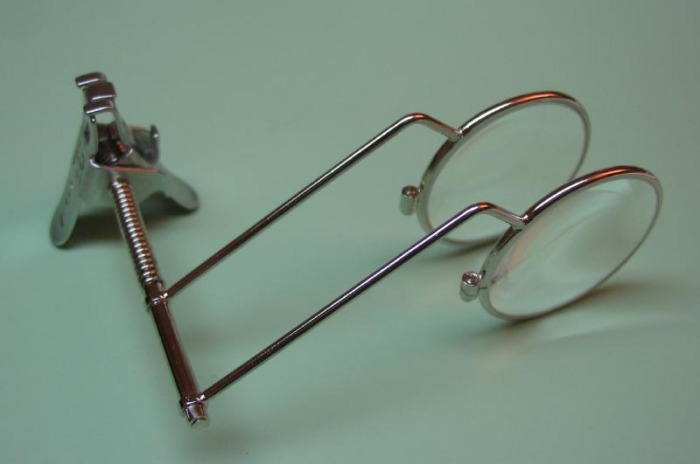 Below is the Bergeon-Ary spectacle loupe which clamps to the eyeglass frame and has a hinged, traditional style loupe. This is a 5X loupe (others are available, including a removable 10X booster lens). The optics are quite nice, I regularly use this one for wristwatch work. If I were to buy it again or another one I would likely get a weaker power. Another Bausch & Lomb product suited for the eyeglass wearer is their "Classic Metal Eyeglass Loupe." They are available in a variety of strengths and either singles or doubles. Daniels recommends this type of loupe, in a doublet, in focal distances of 5 and 10 cm. The 3x/5x model has focal distances of 5.1 and 8.4 cm, this is closest I could find to Daniels recommendation (by my calculations his would be about 2.5x and 5x). The clamp is a simple type and works well with wire frame eyeglasses (a problem with some other type of similar loupes). An advantage of this arrangement is that the lenses can be combined to provide a stronger magnification. 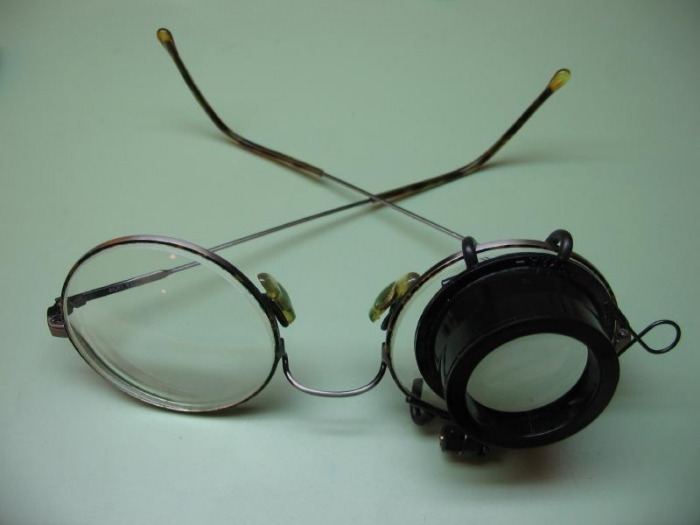 The above type of loupe tends to get in the way, as it attaches to the side of the eyeglass frames. A center mounted assembly may be preferred, but will likely need to be made. The construction of the assembly below is detailed on another page. It uses two 25mm lenses, in focal lengths of 5cm (5X) and 10cm (2.5X). For most general lathe work, I have been using a visor type magnifier. The OptiVISOR is a good quality product, using ground glass lenses. They are available with a variety of different strength lenses and are interchangeable. I chose the #3 lens, which is only 1.75x but has a focal length of 14 inches, so I can stand at a comfortable distance from the lathe. I added the OptiLOUPE auxillary lens, which adds an additional 2.5X, and is highly recommended. 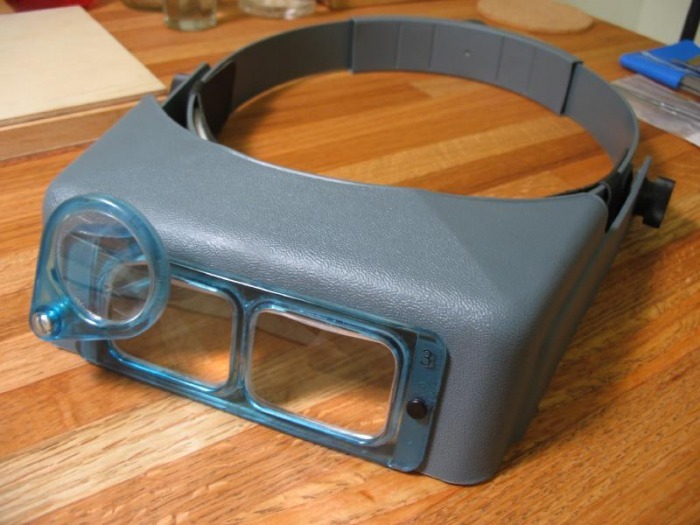 The visor aspect of it is great when working under an incandescent lamp over the lathe. There are manual and automated methods of cleaning. Described here are the methods of cleaning by hand. The complete details of hand cleaning can be found in various texts, such as "Watch Repairers Manual" (H. Fried) or "Practical Watch Repair" (D. DeCarle). In general, solvent(s) are used to loosen and remove old lubricants and debris. This is assisted by brushing and rubbing with shaped pieces of wood. Obviously, this is the most laborious of methods, and any professional shop will be found to use more automated processes. One confusing term found in various books is "benzine," in the U.S. the term is not used, and should not be confused with benzene (an excellent solvent but a potential carcinogen). It took some searching to determine that this refers to the petroleum distillate composed primarily of pentanes, hexanes and heptanes. This seems to be most commonly referred to as 'naptha.' Another solvent of use for cleaning is denatured alcohol, which is primarily methanol. Methanol has the usefulness of being water soluble as well. 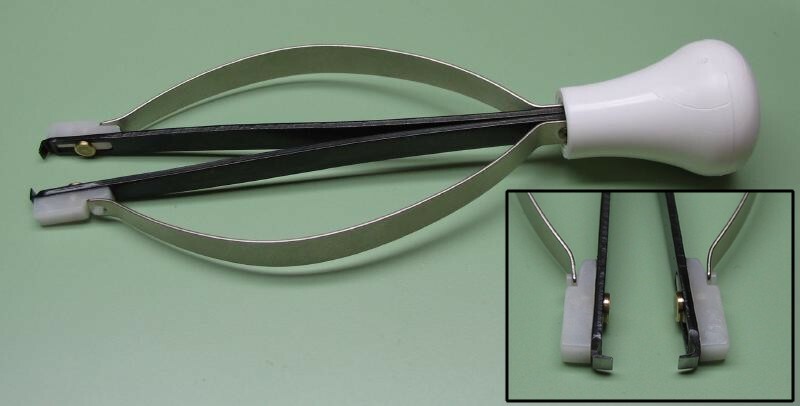 For degreasing of delicate parts, such as hairsprings, trichloroethylene is useful, and can be purchased from tools suppliers under the name "One-Dip." 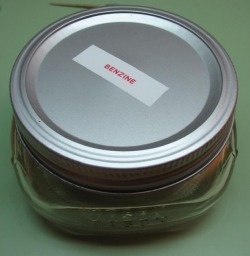 I store solvents in shallow Mason jars. Removal of dirt and such can be easily done with various types of hand brushes. 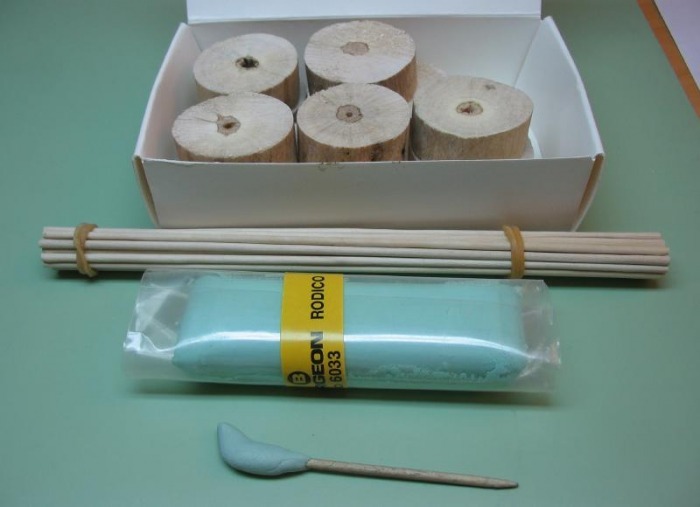 Sometimes referred to as Glasglow brushes, they are available in various grades of stiffness. Solvents will leave a discoloration on the surface of metal if allowed to air dry. To prevent this, parts are dried in 'sawdust.' 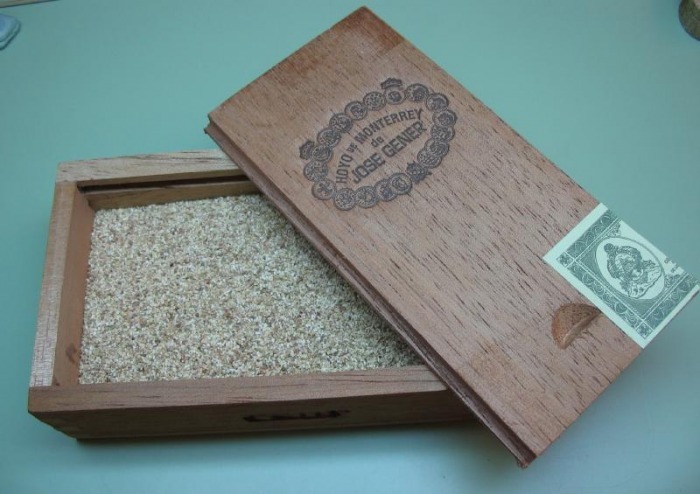 Coarsely granulated boxwood can be purchased from tool suppliers. I store the 'sawdust' in a small cigar box. After the parts are dried, the coarse 'sawdust' is easily blown away with an air bulb. 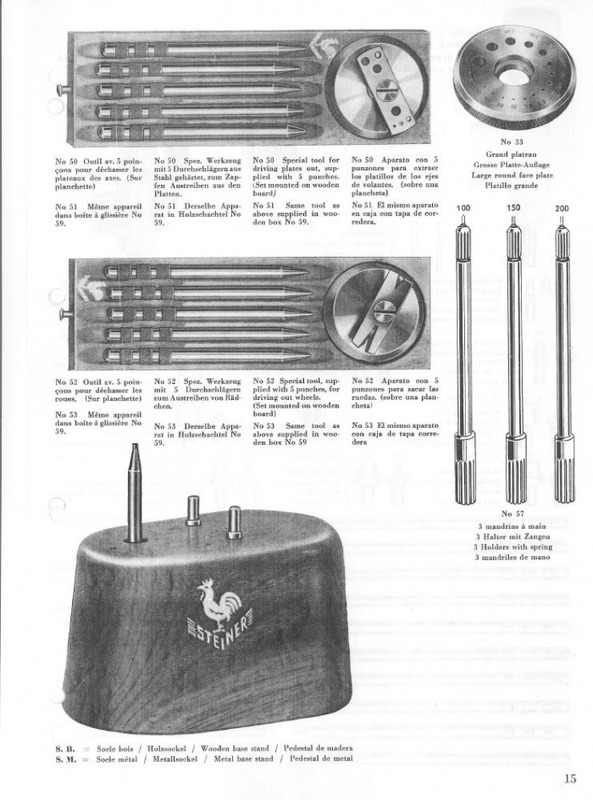 Other sundries useful in cleaning watch parts are 'pegwood,' 'pithwood,' and Rodico. Pegwood can be sharpened to various shaped points to get into pivot holes and other tight spots. Pithwood is a soft, almost malleable wood that sharp tools (such as tweezers and oilers) can be cleaned as well as watch parts, etc. 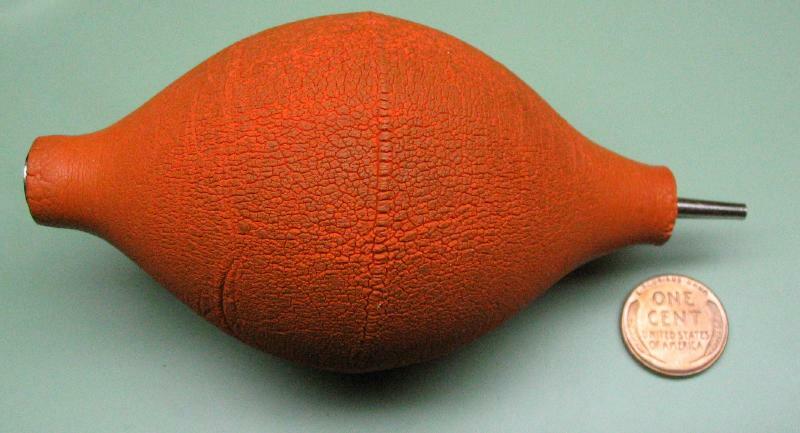 Bergeon's Rodico is a tacky, 'silly putty' like substance that will remove debris and dust as well as fingerprints. Older texts describe the preparation of fresh bread dough for the same purpose. Rodico is apparently the modern, more stable Swiss equivalent. As the Rodico is soiled I progressively demote its use to more dirty applications. In the end I use it to remove emery residue from crevices while polishing. 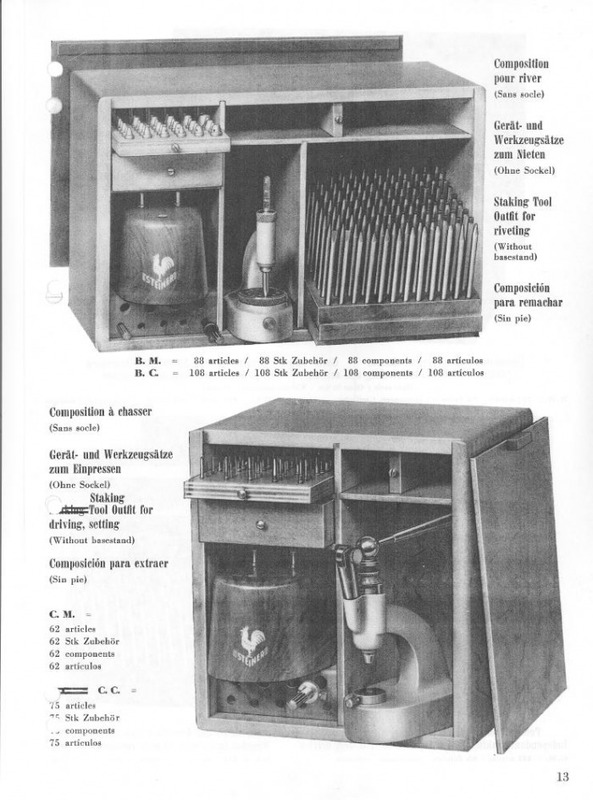 Below is a Vallorbe-Grobet combination pivot file and burnisher. It is for finishing pivot bearing surfaces. The file is about a Swiss cut 8, and can be used to lightly finish the turning marks, and the hardened burnisher is prepared on emery to produce an extremely fine file that work hardens the surface of the pivot. They are sold in left and right hand versions, which is confusing to me since I do not understand what that refers to exactly. I use a left hand version to use overhand on the right side of the lathe (in my right hand!). Hand vises are useful for holding small flat items while working on them, such as filing the spokes on wheels. Shown are an antique pair of hand broaching pliers which are useful for other purposes and a more modern form of hand vise made by Bergeon (No. 2016). They both have a sliding device for securing the work. The Bergeon version have serrated jaws which I usually cover with painter's masking tape to prevent the jaws from marring the work. 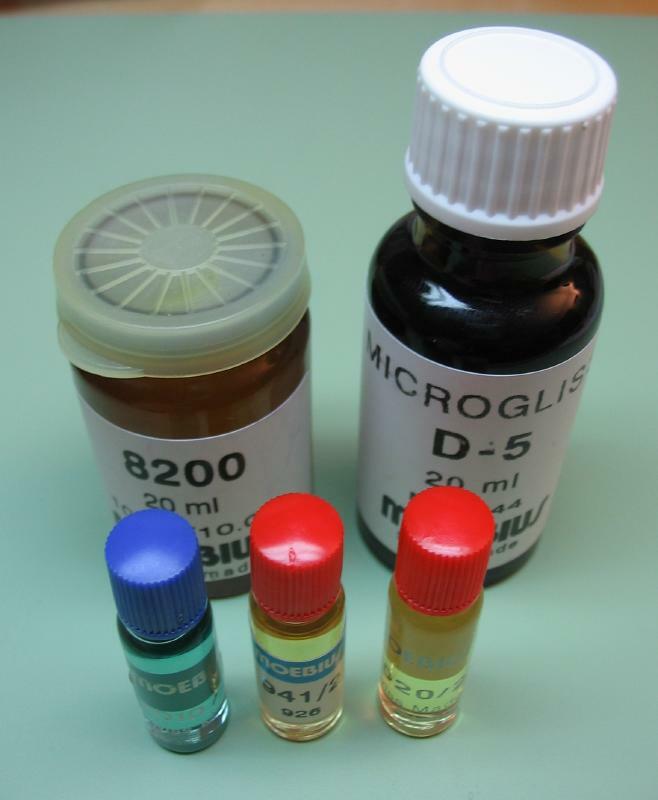 Horological lubricants can vary depending on country and personal preferences. I use both synthetic and natural, Swiss made lubricants. For a watch of the size described on this site, the following range of oils and greases manufactured by H. Moebius & Fils are described. Microgliss D/5 - Mixture of mineral oil and neatsfootoil. Art. 8200 - Mixture of mineral oils, vaselinic grease and neatsfootoil. - grease recommended for mainsprings, winding and hand setting mechanisms. Oils are typically applied using a small needle. 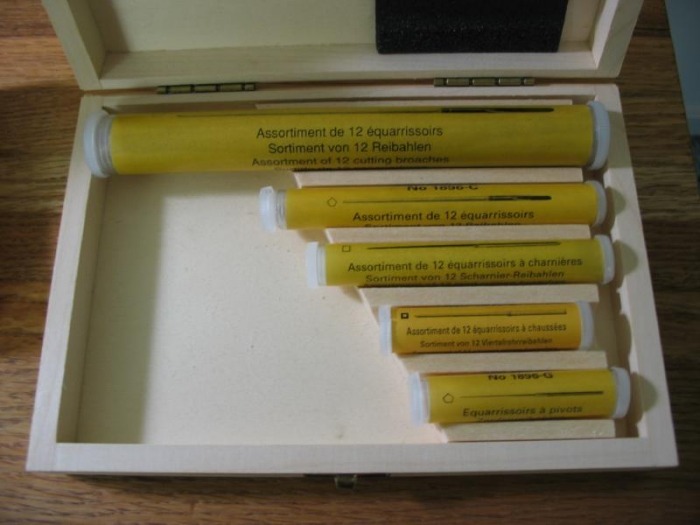 A variety of specially made applicators are available from manufacturers (i.e. 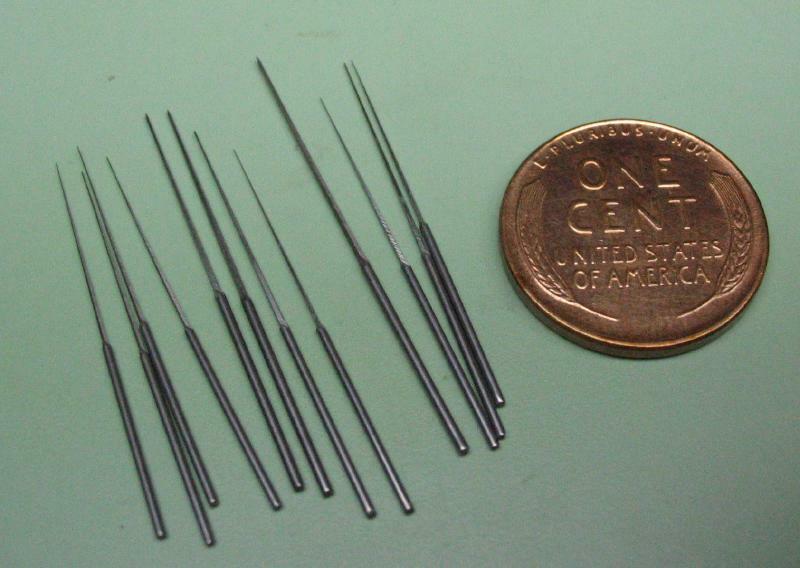 Bergeon), and the most simple form is a set of needles in a range of diameters. 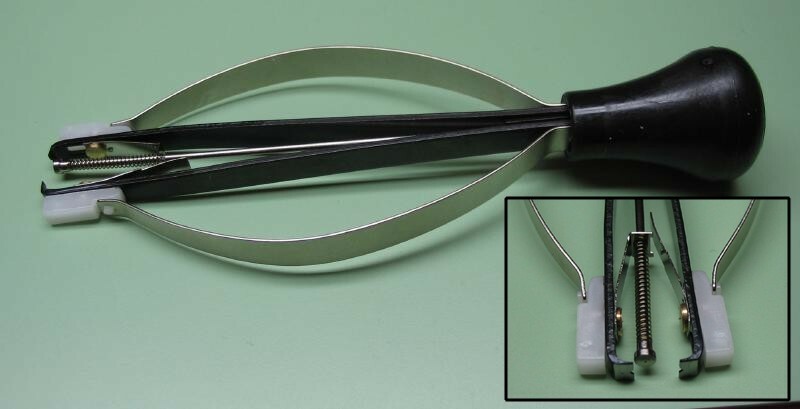 The tip of the needle is somewhat flattened and made to a spade shape in order to hold a small drop of oil, which is then applied by simply touching the tip to the desired location. 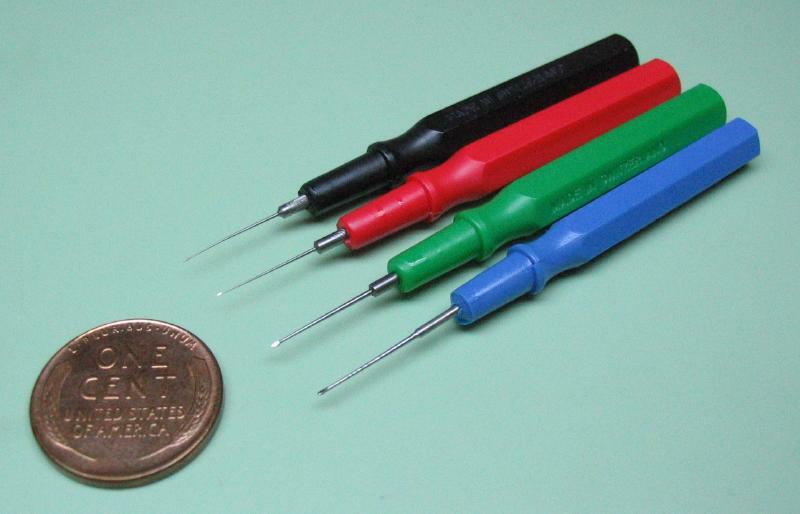 As described in some books, these applicators can be made relatively easily from wire. Before and after each drop of oil I poke the oiler into a piece of pith wood to clean it in order to prevent dirt getting in/onto the wearing surface or bearing. A publication titled "The Practical Lubrication of Clocks and Watches" was, at least at some point, available for download on the BHI website, and can be found below. It is a concise introduction to lubricating watches with modern oils. Below are the material safety data sheets for these lubricants which contains more details of their composition.